I didn’t have to wait that long until I got a bite on the upstream rod which turned out to be a Chub. Not a big one so I didn’t weigh it but it looked about four pounds. I put the rod out again with another pva bag on and sat back and poured a coffee. With my head back looking at the stars I spotted something I hadn’t seen before. A bright light moving very quickly across the night sky followed by another light. It was too high and fast for a plane and it didn’t have any flashing lights. Thinking it was the International Space Station I googled it and it turned out that’s exactly what it was. I’ve never seen it before. Not sure what the bright light was that was following it a short distance behind but apparently when something is coming in to dock or undock then you can see another light shortly behind it. Anyway back to the fishing. I had another bite on the upstream rod a couple of hours later that turned out to be another Chub. It looked a decent fish and thinking it would go over five pounds I weighed it. It came in at 4.12 though. It was the right hand rod where I was expecting the Barbel action though and despite one lost Chub earlier it hadn’t twitched all night. That’s the exciting thing about Barbel fishing though, a bite can come at any moment and without warning and that’s exactly what it did. A twang followed the rod tip knocking as the lead dislodged from the gravelly bottom and I was attached to something decent. I have to admit I played this fish very carefully after losing that one last year. I’d still got quite a bit of weed in front of my and I didn’t want to lose this fish. If I was going to lose it I at least wanted to see it first so I had an idea of how big it was. I could feel it going through weed beds as it came across river and then it locked up. Thinking history was going to repeat itself I applied a bit more pressure but it wouldn’t move. I slackened of the clutch and got a higher vantage point slightly downstream which did the trick as the fish freed itself. Gently easing it in I managed to get a glimpse of it. It was a good fish, not a pb but a good fish. On the scales she went 12.1. At least it wasn’t another eleven which seem to follow me everywhere I go. I stuck it out until midnight but unsurprisingly that was the last of the action. Before I left I fired out what was left of my bait as the plan was to return the next evening and fish the same spot again. Last night I arrived at the river a bit earlier than the previous night on what was a gloriously sunny evening. Arriving a bit earlier it gave me a good chance to put a bed of bait out while it was still light. I made a slight change from the previous night and instead of putting the left hand rod mid river I put across to the other side. Confidence was sky high for when it was dark. Gone are the days when you could catch multiple Barbel in the day unfortunately. You can still get the odd one’s, but night time seems to be where it’s at now. If the Barbel didn’t feed I was pretty sure I would get a Chub as there seems to be a lot about at the moment. 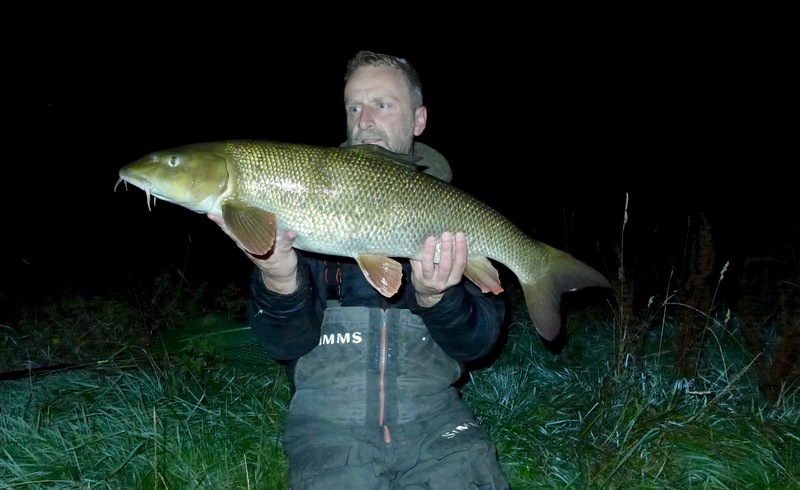 Not long after dark a Barbel crashed over the bait on the right hand rod. It’s fair to say I leaned forward in my chair in anticipation of a bite coming fairly soon. Ten minutes later a Barbel crashed over the left hand rod placed 20 yards upstream. Hmmm, that didn’t do my confidence much good to be honest. I’m pretty sure it was the same fish and if it was then it obviously wasn’t feeding and more than likely just on it’s travels. I sat there and I sat there waiting for a bite but nothing came on either rod. I heard a good fish crash out downstream but it was so far away I couldn’t see where it came from. Slowly those niggling thoughts started to creep into my mind. I really started to think i’d made a school boy error fishing the same spot again. I break the river down into sections and this was only a short section. There might only be one or two Barbel in it for all I know. Should I have headed to another area and fished fresh water. In hindsight yes, but the lure of the previous nights fish and thinking this area should do a really big fish at some point drew me back. The problem is I keep thinking back to the halcyon days or multiple fish catches and it’s just not like that anymore. You’re fishing for one bite and I think that is key. Keep moving and trying different areas. I will fish that spot again but i’ll give it a rest for a few weeks. I want to try a longer section next. An area where i’ve never caught a Barbel but it looks too darned good not to hold a few fish. Unfortunately that won’t be until the back end of next week now though. Next Article Legs 11 again – aaaaarggghhhh!!!!! Cracking Barbel, I just wish the Otters hadn’t eaten all the Barbel in my beloved river Wensum. There plenty of Chub but I just can’t get excited about them. Thanks Rob. I know what you’re saying. Are there any Barbel left at all? I saw two Otters on the Trent the other night. The trent is a big river so can hopefully stand it a bit more but some of the smaller tribs have otter’s which is not a good sign. I haven’t seen any Barbel on the Wensum for a very long time. I believe there may be a few left on some of the upper stretches but us mere mortals can’t get on those areas. So heartbreaking to see the decline. Years ago I dived a Mill Pool at Lenwade. We were on a Police Dive training day and I was first in. To cut a long story short, there were Barbel of all shapes and sizes everywhere. It was an amazing dive and I thought the Wensum would be a river to behold forever. Sadly, Tarka has destroyed all of that and I just don’t know what the answers are. Good to see someone is getting some good barbel .the otter situation is a bad sign there’s a weir on the severn I fish has a family of them the Barbel fishing is non existent at the moment .used to do lots of fish of all species but not now odd chub and perch loads of bleak that’s your lot .could never get on there now most days never see an angler . Another great post. The chub have certainly turned on the feed. My last session one on spam and the session before that two and again on spam! My cheese paste isn’t being sniffed at 😢 I’ve definitely seen an incline of mink down south, not too long ago one had attacked my keepnet of roach, made a right mess of my net.